Excuse me if this post doesn't make any sense. That Frozen movie is on in the background, and well, I'm repeating line for line in my head along with trying to type this up. Do you wanna build an artichoke dip? If you are new here to The Diva Dish I'll fill you in a quick bit on my family. I have two little daughters, who some how have become WAY smarter and sassier than I ever could be. I love them so much it hurts! I also have another daughter on the way this February!! I'm married to the hardest working babe I know, and he could eat every single day of his life LOVES McDonalds. And...This is a healthy lifestyle blog. I get a lot of emails and comments from parents who feel like they don't know what to do because their little one "just won't eat healthy", or "only loves macaroni and cheese!" They wonder how on earth I do it, and why I am so lucky to have kids who love vegetables and are disgusted from fried food and cheesy noodles. I'm here to break the news to you my friends....My kids are NOT good eaters. Their picky-ness and my desire to raise my family living a healthy lifestyle is why I started this blog in the first place. I knew that there were others out there struggling with the same issues I was, and I wanted to share my successes and well..my fails. So here's the deal, Let it go. OMG, sorry...Frozen. But seriously, I've learned to ease up a little. If I stress and cry and force feed, it never ends pretty. If I spend 75 minutes making this healthy incredibly stressful dinner, I most likely will have each child take two or three bites and then they are done. SO I keep it simple. I've made a wide range of food for them, but I've paid close attention to which types of 'foods' and healthier foods they prefer/enjoy. For example, my oldest doesn't like things too salty, too sweet, mushed together, or funny looking. My youngest is the opposite. She likes flavors and will try almost anything. But she eats like a bird, so when I feed her I try and make sure it's filling and full of fats/proteins/etc. Doing that has allowed me to play with their food preferences and make some of the food they love and prefer a little healthier. 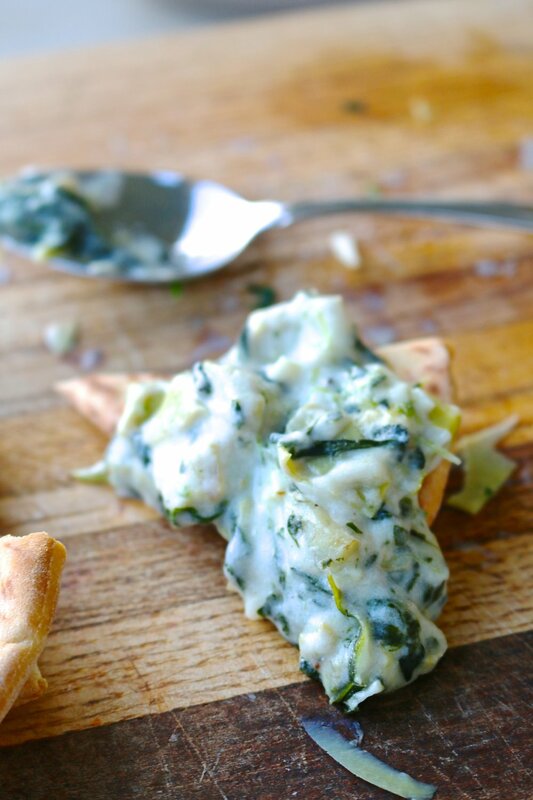 A while back we were eating at a restaurant with family when someone ordered spinach artichoke dip as an appetizer. When it came I joked with my 4 year old (the flavor/mushed together food hater) if she wanted to try some. She shockingly did, and ate bite after bite. 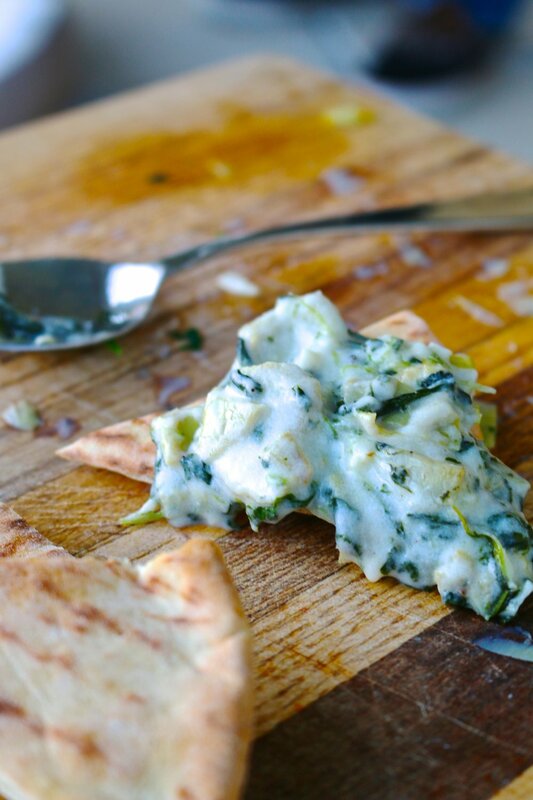 Spinach artichoke dip at restaurants are most likely not healthy. There is probably a lot of butter, cream, unhealthier fats, and lots of cheese stuffed in there. So do I stop her from eating it? She's not on a diet. She's a growing girl, and a picky eater. Are some fats and a lot of butter going to just RUIN her? Of coarse not. So here is my 'healthier' version of spinach artichoke dip. It has healthy fats, veggies, protein, etc. Everything our growing kiddos need! And, adults with chipped red nail polish too, of coarse! In a sauce pan add your 3 TB. coconut oil and melt. Then add in your garlic and cook over medium heat for a couple of minutes. Next add in your spinach and toss into the garlic/oil mixture. Cook over medium/high heat for about 3-5 minutes. In the same pan, add your artichokes. On medium/high heat, cook the artichokes for a few minutes until they have some color on them. Remove the artichokes from the pan and place on a plate and set aside. Whisk together until a paste forms. Then slowly whisk in the coconut milk. Continue to whisk on medium heat, or a little higher, until the mixture becomes thick. Next whisk in greek yogurt and combine until creamy, followed by the parmesan cheese. Stir until everything is melted and combined. Sprinkle a little bit of salt and pepper in. Next, fold in the spinach and artichokes. Pour mixture into a greased baking dish, 9x9 or which ever size you prefer. Eat immediately, OR top the dip with a little extra shredded parmesan and bake at 375 degrees for 10-15 minutes. I served this at my parents house and everyone ate them with baked pita chips, but my 4 year old loves them with salty tortilla chips! Who knew?! You could easily dip carrots or cucumbers in this too, which I think would be a great alternative to the bread. I'd love to hear about your kiddos, their food preferences, and if they are picky or not and what you do with them to encourage them to eat!